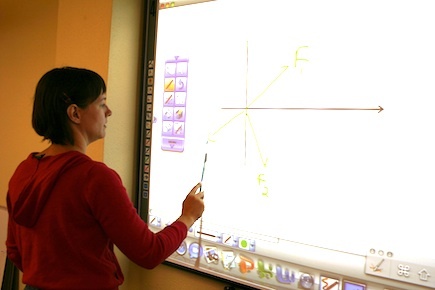 Oregon State University is trying out a new type of classroom for its introductory physics courses, which typically have 75 to 100 students. 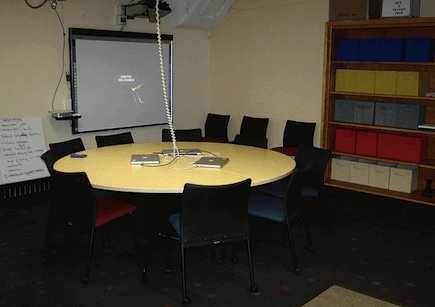 The space, introduced in spring 2010, replaces rows of desks with round tables and covers the walls with giant interactive whiteboards. The idea, according to the assistant professor behind the new physics studio, is to move away from teacher-centrism. "We know when students are actively engaged with course material they'll be more successful," said Dedra Demaree, an assistant professor of physics who promoted the classroom makeover. "It's important to give students the opportunity to do things in a more authentic way, to not just listen but to engage in the practices of their field." The studio, funded by private donations and the university technology resource fee funds, is modeled after a project at North Carolina State University called SCALE-UP or Student-Centered Active Learning Environment for Undergraduate Programs. At NC State, students sit in groups working on hands-on activities, simulations, or labs while the instructors move around the room working with individual teams. At Oregon State the studio project groups students into three sets of three at each table and provides each team with a laptop and a traditional whiteboard. They also have access to the Hitachi StarBoard interactive board nearest to them. Demaree can communicate to each team through the laptops or via the StarBoard to share lessons, group assignments, or team work. Three teaching assistants work with Demaree to help students. A low-friction floor cover in the center of the room provides space for students to work on experiments. A special wiring system from Convia provides ceiling tracks that allow users to run cables and electric wires from the ceiling and then reroute those wires when the room's configuration changes, eliminating the need for rewiring. It also allows for flexibility with lighting in the room to brighten or dim different portions of the room as needed. During that spring tryout of the new space, 185 physics students had two hours of lecture each week, two hours of lab work, and two hours in the studio. The studio time was used by students to solve a series of physics problems in their small groups. Previously, students had three hours of lecture time and three hours of lab work. The new space, said Demaree, "promotes the goal of thinking about reasoning rather than trying to match a textbook answer. It puts students in charge of generating the solutions.... I think this method is really powerful."